We offer a full out of hours service to repair or secure doors on sites across Newmarket. We can install a wide range of doors both manual and automatic. We have a highly experienced team that can provide advise on the best course of action when it comes to installing doors in both commercial and domestic properties. 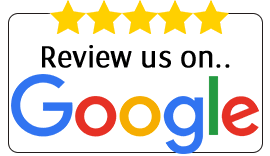 We have a friendly team that is happy to help so get in touch with us today. What do you look for when you require an automatic door installation or if your existing system needs to be repaired? If you require all of the above, then BBG Entrance Systems are the contractors for you. We supply, install and maintain all makes of automatic doors and have been providing superior services. Based in Toronto, we cover all of GTA areas including Ajax, Mississauga, and NewMarket. 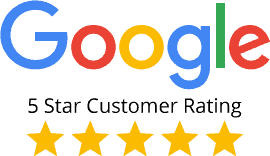 Our success is founded on delivering a consistently high level of customer service to all clients. We strive to meet our customers’ needs as well as exceed them. For all pedestrian access please contact us on 1-888-224-8688 or clicking here. Our key services are to supply, install and maintain all types of automatic doors, manual doors and access control. 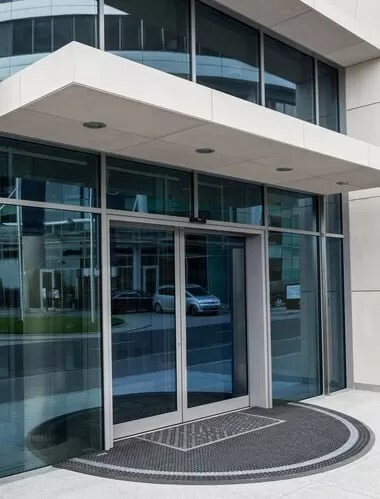 Maintain high levels of safety, reduce the risk of accidents and legal action, and get the most out of your automatic doors over time with an BBG Entrance Systems service contract. We can maintain systems in organisations such as Universities, Schools Colleges, Hotels, Restaurants, Shops / Retail, Trusts, Local Authorities, Police. Call 1-888-224-8688 now for more information on how we can improve access for your building or facility. Our initial full site survey will ensure that we provide the best solution for you. We can supply and fit the following automatic doors: swing, sliding, revolving, prismatic, curved and folding. We also provide video entry systems, security turnstiles, raised arm barriers, roller shutters/aluminium doors and shop fronts. All mechanical systems with moving parts will face some issues or even breakdowns at some point. Our fast and reliable call out service ensures that the downtime and disruption caused by this are minimised, and your security levels are restored as quickly as possible. Call 1-888-224-8688 now for more information. 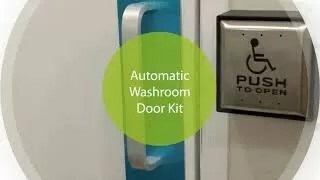 These include Swing and Sliding Door Operators, Swing Door Activation Sensors, Push Pads, Touch Pads, Barriers, Access Control Systems, Disabled Toilet Doors, and a range of popular accessories. Why Choose BBG Automatic Doors? We offer a full out of hours service to repair or secure doors on sites across GTA areas. 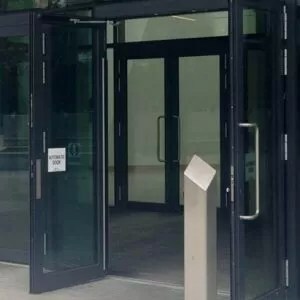 We can repair a range of manual and automatic doors on commercial properties and aim to get the job completed as soon as possible. ADA handicap door operator is designed for those who use wheelchairs or other aids, also they can be used by the elderly, mothers or someone pushing strollers, or someone need to carry along. Our handicapped door mechanism can help you install a facility with an ADA compliance requirement or change normal doors to automatic for easy access. No need extra cost for change the door or the wall. 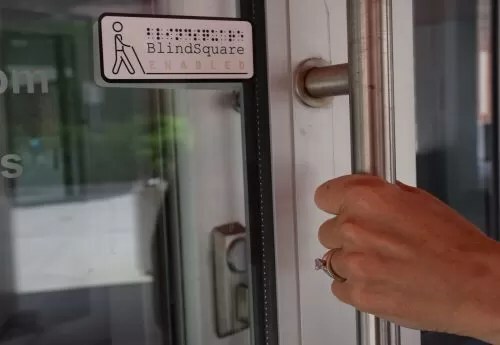 Handicap door operators are normally work by a push button on the wall, motion detector installed above the door, wall switch operated both wired and wireless, or card reader styles. 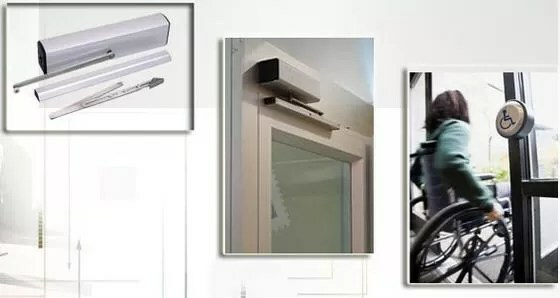 For care about these special who need assistance, door opener for disabled should not only in hospital or home, but also should be installed in public, like office buildings, schools, supermarket, toilet and many other public buildings. 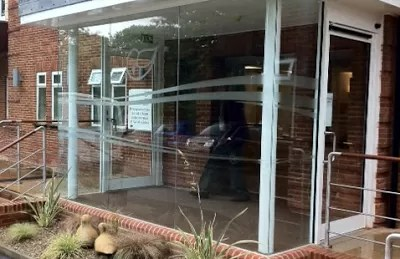 Our automatic door systems can be manually adjusted for a hold-on open time ( 1- 30 seconds ) or set to require a manual signal to close after the user is ready. Also it can set the opening and closing time. Most types of industrial and commercial door have the potential to be manually operated, powered, or even fitted with an automated system that can prevent anyone having to directly operate the door. Whether roller shutter door or sectional overhead installation, an important add-on to consider is electric operation and automated opening systems. Many of our customers consider such installations as something of a luxury item but they can offer a range of benefits to all kinds of industrial and commercial businesses when suitably applied. Our expert team of installations engineers carry out powered opening system and automated opener upgrades to existing doors, and can of course install something suitable to all new installations. Almost all of our roller shutter doors and folding shutter doors can be automated along with many others. We want to provide ease of access for you, but still keep the high security which we have done for many commercial and industrial properties. No matter the door requirements, be it a sectional overhead door, a fire shutter or one of our many other products; we will provide the best in door automation. Call us today on 1-888-224-8688 to speak to the experts in shutter maintenance and door automation. Any reduction in manual effort is a good thing, and reduces risk of injury to your team. 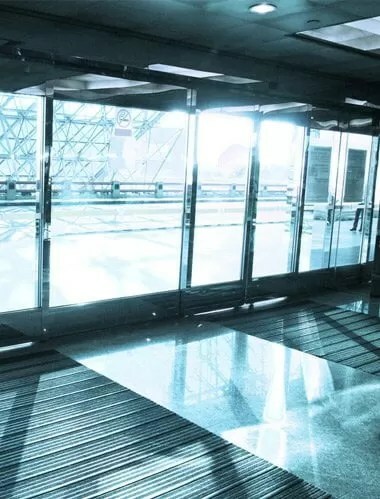 Increasingly, most industrial door installations have powered opening systems added to them, so that at the press of a button, the door is open, which electrical and mechanical systems doing all the hard work. These systems are simple to care for and stay functional for many years as a very cost effective solution for your team’s good health and also the health of the door; smooth electrical operation at a steady pace reduces day to day stresses on the door and the potential for breakdowns. 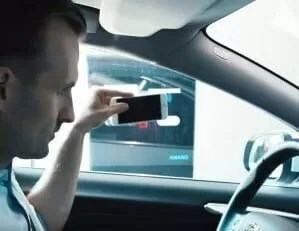 A step up from simple powered operation, automated systems can respond to remote control and various other triggers to open and close themselves. A popular installation to domestic garage doors for anyone who wants to keep out of the rain, these can also be very useful in an industrial or commercial environment where there is a regular flow of traffic, such as a distribution hub or logistics centre. In these situations, doors that can be opened remotely can save a great deal of staff time walking back and forth to the door, but of course also require advanced health and safety efforts to ensure doors aren’t blocked and can also respond automatically to problems such as foreign objects or even people being attached to them, such as an infra-red sensing beam. Commercial shutters and industrial shutters are all able to be attended when they need maintenance or repairs with our emergency shutter repair service. If the automation systems stop working or if there is damage to the door itself; our experts will be on hand to get to your property to deal with the situation professionally and efficiently. Roller shutter repairs can be required if there is damage inflicted to the door which should not be left unattended. Be it for an industrial shutter repair or a commercial property; we will ensure that we repair all damages and get everything running again while also trying to minimise the disruption to your workplace. Modern technology can find ways of improving even the simple door! As part of our door installation survey our engineers can advise you on all the options and available and how well they may be applied to your specific property and requirement. To learn more, contact our team today and arrange for a consultation throughout Newmarket. 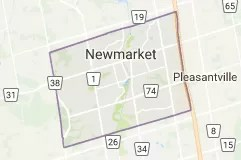 Newmarket is a town and regional seat of the Regional Municipality of York in the Canadian province of Ontario. It is part of Greater Toronto in the Golden Horseshoe region of Southern Ontario. BBG specialise in the supply, design and installation of automatic doors and entrance. 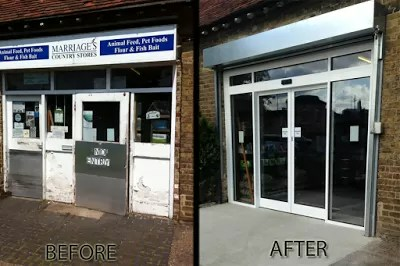 We supply, service & maintain a range of Automatic Sliding, Swing Doors in Newmarket.